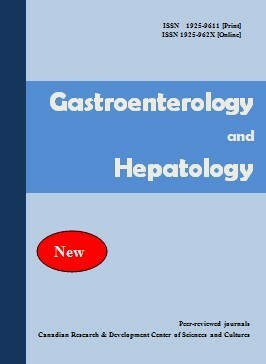 The Gastroenterology and Hepatology (GH) publishes peer-reviewed original papers, reviews, metaanalyses and systematic reviews, and editorials concerned with clinical practice and research in the fields of hepatology, gastroenterology and endoscopy. The GH is designed to disseminate knowledge in this field to a worldwide audience. The journal is supported by an editorial board consists of international experts in gastroenterology and hepatology. The host organization of the GH is the Canadian Research & Development Center of Sciences and Cultures (CRDCSC) located in Canada. Papers cover the medical, surgical, radiological, pathological, biochemical, physiological, ethical and historical aspects of the subject areas. Clinical trials are afforded expedited publication if deemed suitable. GH also deals with the basic sciences and experimental work, particularly that with a clear relevance to disease mechanisms and new therapies. Case reports and letters to the Editor are also accepted. The acceptance criteria for all papers and reviews are based on the quality and originality of the research and its clinical and scientific significance to our readership. All manuscripts are peer reviewed under the direction of an Editor. The Editor reserves the right to refuse any material for review that does not conform to the submission guidelines detailed throughout this document, including ethical issues, completion of an Exclusive License Form and stipulations as to length. All articles, with the exception of Editorials, must contain an abstract of no more than 250 words. Abstracts for original articles should be formatted into subheadings, as detailed below. Titles must not be longer than 120 characters (including spaces). These are invited by the Editor-in-Chief or their delegated editor, and should be a brief review of the subject concerned, with reference to and commentary about one or more articles published in the same issue of GH. GH welcomes reviews of important topics across the scientific basis of gastroenterology and hepatology, and advances in clinical practice. Most published reviews are in response to editorial invitation, including thematically related "mini-series" of reviews. Authors considering submitting a review for GH are advised to canvas their possible review with the Editor-in-Chief or a colleague editor; this avoids early rejection if the subject matter is not deemed a high priority for the Journal at the time of submission. GH particularly welcomes submission of Meta-Analyses and Systematic Reviews, which underpin evidence-based medicine. GH welcomes original articles concerned with clinical practice and research in the fields of hepatology, gastroenterology and endoscopy. Papers can cover the medical, surgical, radiological, pathological, biochemical, physiological, ethical and/or historical aspects of the subject areas. Clinical trials are afforded expedited publication if deemed suitable. GH also deals with the basic sciences and experimental work, particularly that with a clear relevance to disease mechanisms and new therapies. The Editors welcome contributions to the Education and Imaging section (Hepatobiliary and Pancreatic or Gastrointestinal). The purpose is to present imaging for the evaluation of unusual features of common conditions or diagnosis of unusual cases. Contributions will be reviewed by the Education and Imaging Coordinating Editors. The format of the Hepatobiliary and Pancreatic Images pages involves two parts, each of which will occupy up to one journal page. In part 1, a case will be described briefly, including a summary of the presentation, clinical features and key laboratory results. One to two key images will then be presented. It is helpful to the reader if the author responds to questions that follow from the images of the case, such as 'What is your diagnosis? What are the features indicated on the CT scan? What is the differential diagnosis?' Part 2 will briefly describe the imaging features, particularly those that lead to diagnosis or which are critical for management. Differential diagnosis should be mentioned. It will be useful to include either further images or pathological details that validate the imaging diagnosis. Occasionally, presentation of analogous cases or related images from a similar case might be appropriate. Please include between one and three references to definitive studies and appropriate reviews of the subject. The format of the Gastrointestinal Images page involves a brief background to and description of the disorder of interest together with two figures of high quality. Colored endoscopic photographs are encouraged. The submission may take the form of a case report or may illustrate particular features from more than one patient. All letters will be considered for publication. Single case studies will be considered for publication. These should include a brief description of the case and a discussion including a review of the literature. Cases will be reviewed by an expert in the field and will be published with the expert’s commentary. 1. The manuscripts are required to be written in English, and they should be submitted to gh@cscanada.org or caooc@hotmail.com. 2. We will send you a confirming E-mail in four days after receiving your article. Please contact us if the E-mail is not timely delivered. 4. The copyright of the articles goes to the authors, while GH owns the first publishing right. 5. In this year, as for the publication fees, 100% of the articles are free, on the basis of assessment results given by our editorial team.